Oris is known for their unique watch designs and innovative technology. Priding themselves on their award-winning reputation, Oris set the standard for Mechanical watchmaking. Owning one of these amazing timepieces is a treat, and now anyone can. In March of 2010, in celebration of their 20,000 member log-in to MyOris, the company offered a chance to own a limited edition Bob Dylan graphic. After successfully completing an on-line quiz, a Frenchman named Sebastien Bisson was the lucky winner. Oris has a long history, rich in respect for all who excel at what they do. The Bob Dylan limited edition was created as a tribute to this iconic musician. It is a sleek and streamline design, with a black leather strap and a stainless-steel case which bears a portrait of the artist on the back. The face is jet black and is autographed by Bob Dylan. Only 3,000 of these amazing timepieces were produced worldwide, and Sebastien Bisson claimed his. This Swiss-made man’s watch, from Oris is something for fans and music lovers to treasure. 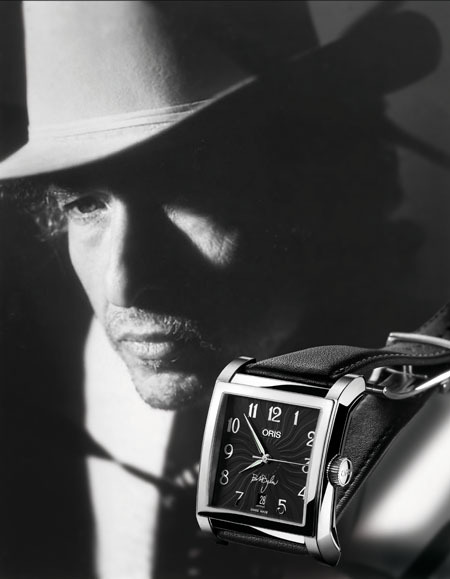 The Bob Dylan limited edition watch is sold as a set, paired with the harmonica Bob Dylan is best known for, the Hohner Marine Band. You may not have taken home this one, but Oris has promised to hold more contests in the near future, so don’t loose hope. Register for MyOris today. Your Oris awaits!